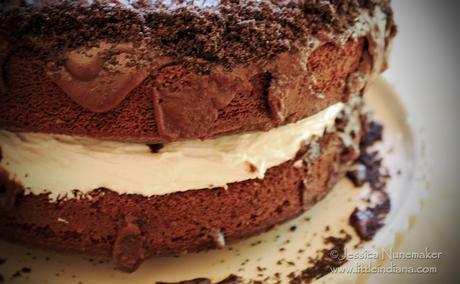 For the best chocolate cake recipes, you can definitely rely on this monster of a show-stopper! With a fluffy marshmallow filling and a chocolate glaze, which gives a lovely sheen on the top, it’s the perfect ending to any meal–and particularly a great birthday cake choice, too. I made this King Arthur Flour recipe from the KAF Baker’s Companion cookbook. Get it, it is wonderful! I would recommend serving this with vanilla or chocolate chip ice cream. Another winner from the King Arthur Flour Baker's Companion Cookbook. I know a couple of small town bookstores where you can get it! The Chocolate Glaze recipe is not from KAF. Blend Sugar, Flour, Cornstarch, Cocoa, Buttermilk Powder, Baking Powder, Baking Soda, and Salt. Beat in Eggs, 3/4 Cup Water, Oil, and Vanilla Extract for two minutes. Pour batter into pans (it will be go from thick to thin after the Hot Water addition). Bake 30-35 minutes or until cake tester comes out clean. Cool 10 minutes in pan and then invert onto wire rack to cool completely. Grab one layer and put if rounded (top side) down onto a serving platter. Spread with filling. Top with remaining cake layer, also positioning top side down. Pour glaze slowly over the top. Beat together Shortening, Butter, Salt, Vanilla Extract, and Powdered Sugar until fluffy. Beat in Corn Syrup a bit at a time until blended. Beat in Marshmallow Creme just until blended. Combine Chocolate Chips, Butter, and Corn Syrup in top of double boiler. Melt and add in Vanilla. Cool so it thickens a bit but still pours. Substitute Buttermilk Powder with 1/4 cup Buttermilk (or soured milk) thereby reducing Water amount from 3/4 cup to 1/4 cup. Suggested garnish included crushed candy canes or mint chocolate cookies. I used crushed chocolate wafer cookies. Schema/Recipe SEO Data Markup by ZipList Recipe Plugin2.0http://littleindiana.com/2012/06/best-cake-recipes-chocolate-cake-with-marshmallow-filling/Photos are the Property of little Indiana. Do Not Use Without Permission.